Good Friday is a Public Holiday in Malta and the Marina Office will be closed. The Marina Assistants will be on duty 24 hours as usual and can be reached on 79337249. Normal office hours resume from Saturday morning. Boat owners are advised that the forecast is for gale force North Easterly winds and heavy rain from Saturday night and continuing through Sunday 24th February. Prepare and help us to keep your boat safe by checking your boat, ensuring that fenders are in place, sails are secure, CANOPIES are DOWN, and the boat is tied properly, well clear of the pontoon. 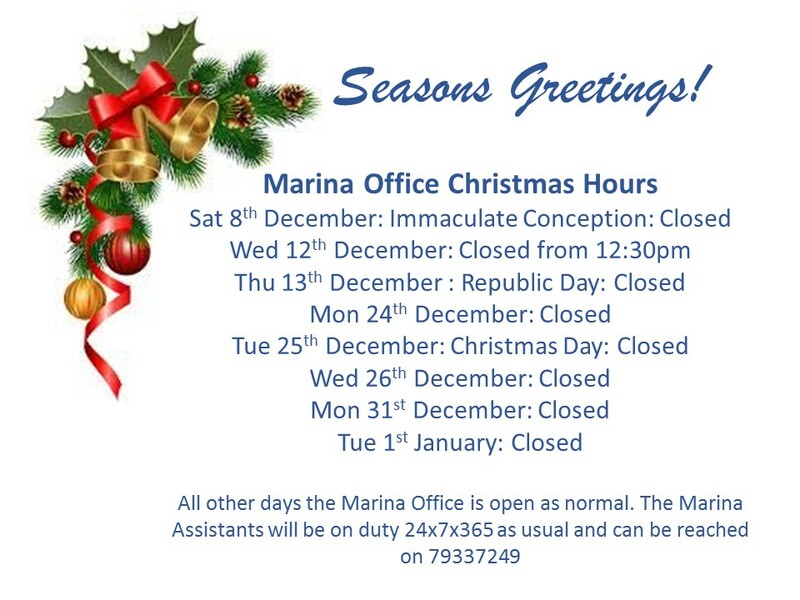 The Marina office will close at 12:30 instead of 14:00 on Wednesday 12th December, for the staff Christmas lunch. Click to see a full list of the Christmas Hours. Boat owners who have been out cruising all summer, are reminded to call the Marina Office on +356 2133 7049 3 days before returning to the Marina, to give time to check ropes and winter moorings, and enter utility credit back into the pedestal.